For those who can’t help but want to spend this summer gaining knowledge and developing great products in a company of passionate creators and two cats we’ve got uplifting news. 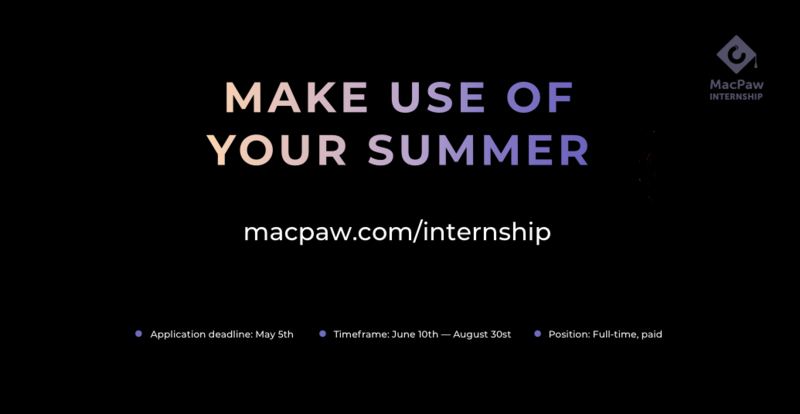 Here at MacPaw we’re launching a Summer Internship where you can grow in one of seven directions. Make use of your summer and apply swiftly! Our specialists are eager to share their knowledge with you. Every internship program will have its mentor that will be your teacher and best friend during the internship. MacPaw is about creating apps and services that improve everyday life for Mac users. We make products that enhance what Mac has to offer; saving people time and energy better spent on the things they love. With MacPaw, Mac life gets better. Important: you don’t have to be a student to apply.